Mass Communication Specialist (MC) are Public Affairs and Visual Information experts. They present the Navy story to audiences in the Navy and to the rest of the world through a variety of media. MCs write and produce print and broadcast journalism news and feature stories for military and civilian newspapers, magazines, television and radio broadcast stations. 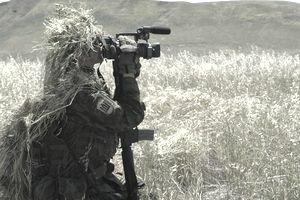 They record still and video photography of military operations, exercises, and other Navy events. They serve overseas, on ships, and at stateside commands as photographers, public affairs specialists, newspaper and magazine staff, and TV and radio station staff and talent. MCs also create graphic designs in support of the public affairs mission, create and manage official websites, and perform high-speed, high-volume graphic reproduction. Mass Communication Specialist may work outdoors or inside, onboard aircraft carrier flight decks, in the field with combat construction units, or in air-conditioned broadcast stations. Work varies from using precision computer graphics equipment in an office, to strenuous work throughout a ship or station. Most MCs work on projects alone or with small teams, normally with little supervision. Their work is primarily mental and creative. Note: Advancement (promotion) opportunity and career progression are directly linked to a rating's manning level (i.e., personnel in undermanned ratings have greater promotion opportunity than those in overmanned ratings). Note: Sea tours and shore tours for sailors that have completed four sea tours will be 36 months at sea followed by 36 months ashore until retirement. What Does it Take To Be a Navy Quartermaster (QM)? What Does a Navy Personnel Specialist Do? What Does a Navy Damage Controlman (DC) Actually Do?